I last saw UFO at Birmingham's Digbeth Institute in 1992 so I thought it was high time I got reacquainted with the legendary rockers. 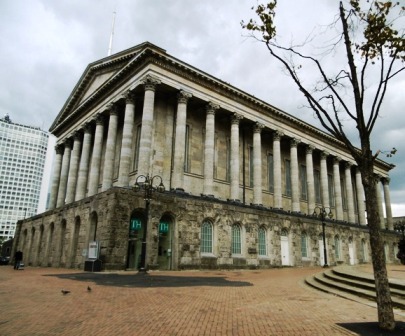 I don't recall them playing Birmingham since 1992 and when frontman Phil Mogg took to the stage at the city's Town Hall he announced that it was indeed a very long time since the band's last Second City gig. They have certainly not been forgotten and received a rapturous reception from the fans – mainly middle aged men with thinning hair and paunches. Stick-thin Phil Mogg has no paunch but the 69-year-old now sports a close shave for a haircut and makes jokes about his love of hats because he gets a cold head. 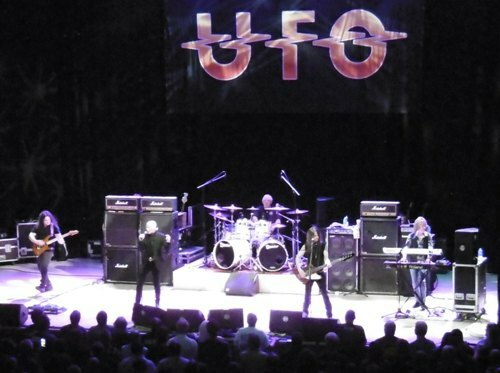 Phil Mogg is one of the main reasons UFO have survived for almost 50 years and still stand apart from other hard rock acts. A founder member, his voice remains strong, he looks like he's enjoying himself and he has an instant rapport with the audience. His between-song banter is a treat. None of that 'Are you having a good time?' nonsense, Phil takes a look around and comments on what he sees. A fan's Cheap Trick T-shirt gets a mention, along with the aforementioned hat. There are random musings on Tony Bennett, the Daily Mail and the beer he drinks on stage. He also admits to messing up the setlist and has a (polite) go at the stage lights operator for only using the white lights. ''I don't want to sound sarcastic but we do have coloured lights as well,'' he says. The other UFO strength is their body of work. Twenty two studio albums means a lot of material to choose from for a one hour, 40 minute show. They kick off with We Belong to the Night from 1982's Mechanix, followed by Run Boy Run from latest album, A Conspiracy of Stars. This is the A Conspiracy of Stars Tour, and it's a fine album, but the only other track played from the record is Messiah of Love. Things really get going when songs from UFO's Golden Era, the second half of the 1970s, get an airing. Only You Can Rock Me from 1978's Obsession, Love to Love and Too Hot to Handle, both from 1977's Lights Out, had the crowd roaring for more. Their wish was granted, of course, including Rock Bottom from 1974's Phenomenon and an encore of the sublime Doctor Doctor and Shoot Shoot. Those classic seventies albums featured lead guitarist Michael Schenker and, although current guitarist Vinnie Moore, who joined UFO in 2003, is not as showy as Schenker – he looks more roadie than rock star – he sure can play. His solos in Makin' Moves and Rock Bottom were fantastic. The other original band member is drummer Andy Parker who thumps those tubs with aplomb. Meanwhile, long-serving Paul Raymond switches between guitar and keyboard, while newest recruit, bassist Rob De Luca, who joined in 2012, is solid without being flashy. 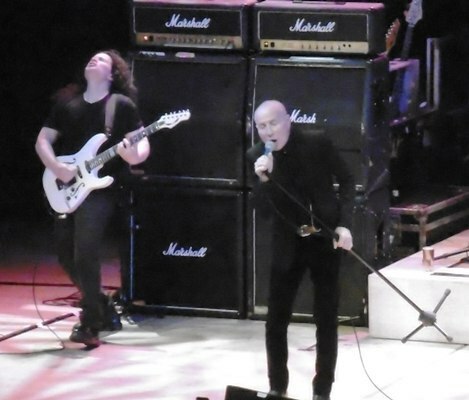 The memorable show was marred only by the sleeping lightman (as identified by Phil Mogg) and some muddy sound which support act Jared James Nichols also encountered. When great guitarists like Nichols and Vinnie Moore are on stage we want their instruments turned up to 11, not fighting with the drums to be heard. 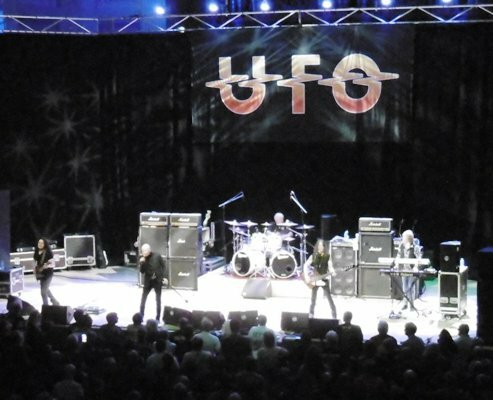 UFO play King George's Hall, Blackburn, on July 28, Cheese & Grain, Frome, on July 29 and the Ramblin' Man Fair, Maidstone, on July 30.